An overlay of a GG-1 locomotive and Acela power car represent the Northeast Corridor, past and present. Amtrak recently installed a new mural in the historic Joseph R. Biden Jr. Railroad Station in Wilmington, Del. It highlights the company’s strong presence in Delaware, which is a hub for Amtrak operations in the greater Northeast. In Fiscal Year 2015, Amtrak spent nearly $9.7 million on goods and services in the state and more than 1,100 residents were employed by America’s Railroad®. The Wilmington metropolitan area is home to various Amtrak offices and two major heavy maintenance facilities, whose history and current functions are discussed below. The Wilmington Shops have an especially rich history that dates back more than a century and starts with the Pennsylvania Railroad (PRR). At the dawn of the 20th century, the PRR was one of the nation’s most prominent corporations and considered a model for its industry. Its lines stretched from the East Coast through the Mid-Atlantic and Midwestern states as far as the Mississippi River. In an effort to improve its infrastructure, the railroad embarked on an ambitious program to straighten its tracks for increased speed and safety and construct new bridges, viaducts, tunnels and passenger stations that improved capacity and conveyed a sense of permanence. 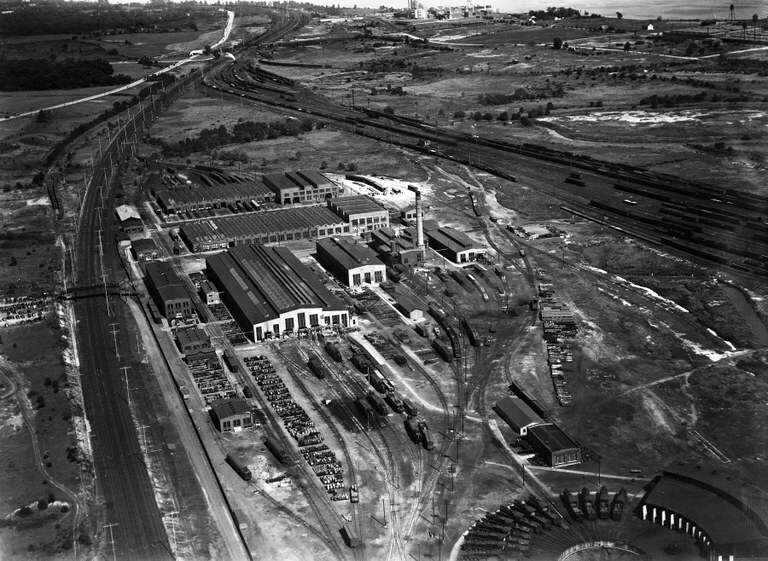 Aerial view of the Pennsylvania Railroad Wilmington Shops, looking northeast, 1938. Photograph by the Dallin Aerial Survey Company, courtesy of the Hagley Museum & Library. The PRR turned to a parcel of land approximately two miles northeast of downtown in a largely undeveloped area known as Todd’s Cut. Located between the Brandywine and Shellpot creeks, it included wetlands that were filled with gravel and soil—to an average depth of 10 feet—starting in fall 1902. Following foundation work, brick and steel buildings began to rise the next year, and all the necessary machinery was in place by early 1904. Elevation of the Erecting Shop, 1902. Courtesy of the Amtrak Engineering Archives. 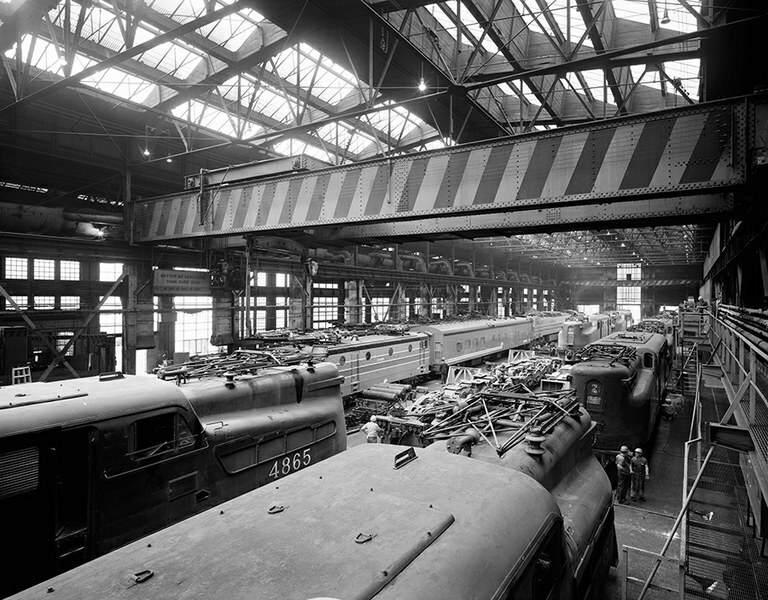 In an April 1904 article, The Railway Age magazine noted: “The whole plant, from the general layout to the location and power of individual machine tools, is the result of careful design.” Among the structures built on-site were a roundhouse, coal trestle, power house and locomotive, blacksmith, paint and car erecting shops. Once completed, the facility could accommodate 35 locomotives and 75 coaches per month for maintenance, repairs and overhaul. All buildings were spaced apart to guard against the spread of fire and allow for the easy movement of materials. They were also designed to be doubled in size if needed in the future. More than 3,100 piles were driven into the ground at the southern end of the property for the 30 stall roundhouse (since demolished), which was intended to eventually contain 44 stalls. The $125,000 building had a turntable that measured 75 feet across. The locomotive building encompassed nearly 92,000 square feet and was divided into erecting, machine and boiler/tank shops. The central erecting shop measured 80 feet across and had three pit tracks. Two 65-ton Shaw cranes, each with a span of 78 feet, towered over the erecting bay. In the machine shop, one encountered tools including lathes, shapers and milling machines. Interior of the repair shop, mid-1970s. Notice that the shop holds a number of GG-1 locomotives, and in the middle of the photo, what appears to be the X995, a Swedish electric locomotive tested by Amtrak. Courtesy of the Historic American Engineering Record. The paint shop, which included a varnish room and tin shop, could hold a maximum 28 coaches. In the car erecting shop were spaces set aside for upholstery and cabinetry. Unlike the other buildings, these two structures featured brick construction with wooden roof trusses. The PRR and its successor Penn Central, borne of the PRR’s 1968 merger with the New York Central Railroad, continued to run the Wilmington Shops until 1976. That year Amtrak gained control of the Northeast Corridor (NEC) as a result of the Railroad Revitalization and Regulatory Reform Act. Then, as now, the NEC was considered the busiest stretch of railroad in North America. According to the Fiscal Year 1976 Amtrak Annual Report, “The Corridor is responsible for an average of 960 trains a day, including over 120 Amtrak intercity passenger trains, nearly 660 commuter trains…and more than 170 Conrail freight and mail trains.” Today, that number has more than doubled to 2,000 Amtrak, commuter or freight trains traveling over some portion of the NEC each day. The NEC purchase included the majority of the 457 route miles between Boston and Washington, excluding sections that Penn Central had previously sold. In addition, Amtrak obtained more than 100 railroad stations as well as maintenance shops and rail yards to service locomotives and rolling stock. 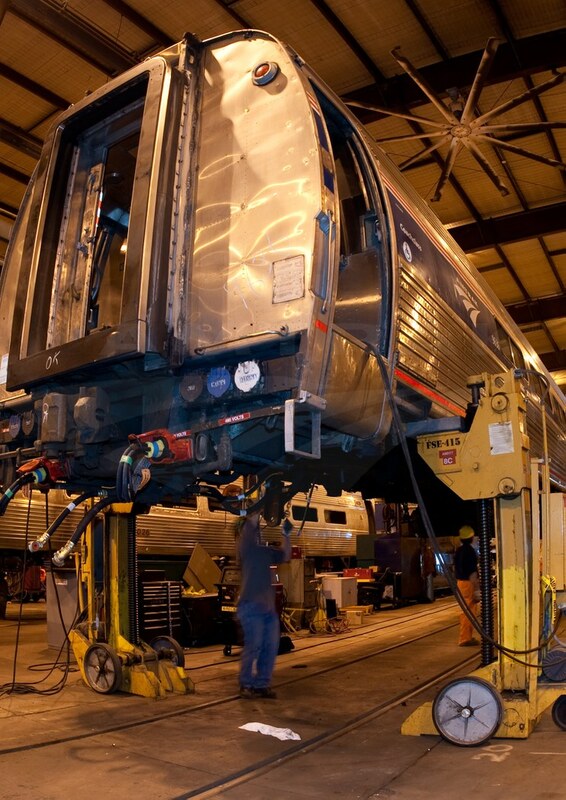 Today, the Wilmington Shops remain the primary facility for the maintenance, repair and overhaul of electric locomotives used on the NEC, including the Amtrak Cities Sprinters (ACS-64s) that began entering revenue service in 2014 and the high-speed Acela Express power cars. 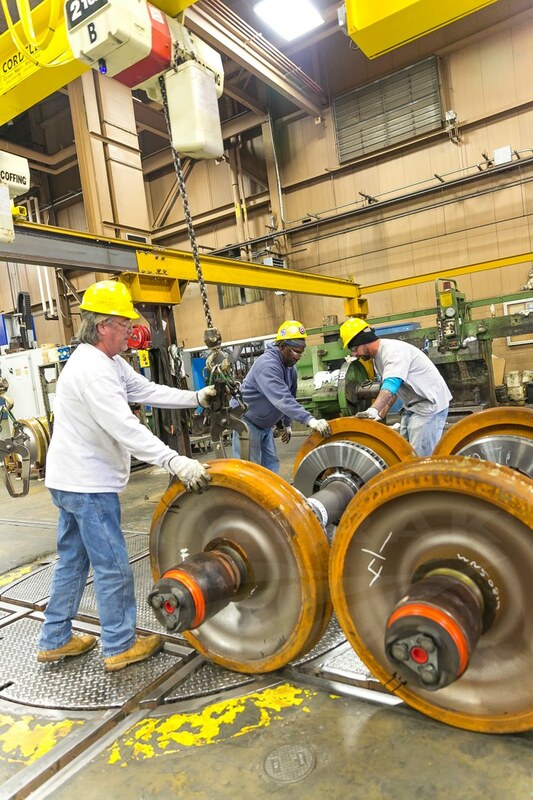 Skilled employees perform truck repair, wheel work, HVAC work, traction motor repairs and component repair and remanufacturing work. Originally built for the manufacture and servicing of piggyback flatbed cars, Amtrak primarily uses the facility for the overhaul and wreck repair of Amfleet I and Amfleet II passenger cars. These include nearly 600 single-level coaches and food service cars used on Northeast Regional and overnight national network trains such as the Silver Meteor (New York-Miami). Maintenance-of-way equipment is also overhauled and stored at the Bear facility. The main shop building encompasses 213,000 square feet and houses the following production lines: support shops (truck, brake component and air brake shops); Amfleet I overhaul line; Amfleet II overhaul line; cab car/overhaul lines; maintenance department; and freight equipment overhaul. The property also includes a seat shop, administration building and parts warehouse. From 2011-2016, specially trained Bear employees performed a major mid-life refresh of the high-speed Acela Express equipment introduced in 2000. The project involved dismantling the cars’ components and replacing them with new or rebuilt components. 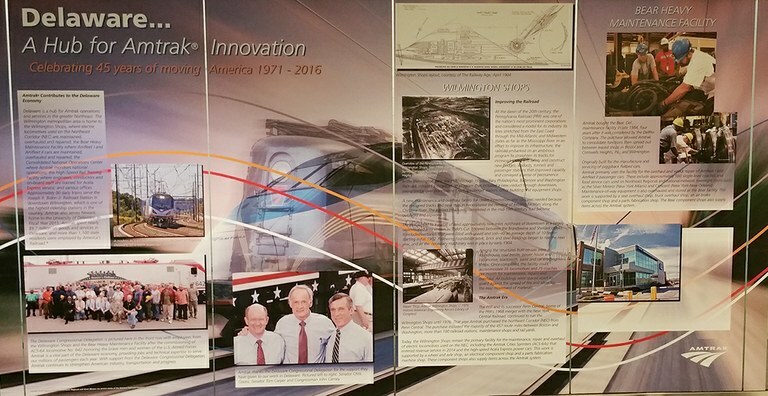 This strategic overhaul program reduced maintenance costs and enhanced the safety, reliability and availability of the Acela trainsets. Upon arrival in Bear, each train set was divided; while the coaches and bistro/café car remained at Bear, the two power cars traveled on to the Wilmington Shops. 1 Debra Campagnari Martin, “Wilmington Rail Viaduct,” National Register of Historic Places Registration Form, United States Department of the Interior (National Park Service), 1999. National Register of Historic Places database. 3 Carol E. Hoffecker, Corporate Capital: Wilmington in the Twentieth Century, (Philadelphia: Temple University Press, 1983), 21. 5 Bob Johnston, “This Ain’t Magic,” Trains, October 2003.